I had no tour booked today. My great idea was to go to Parc Phoenix, a small botanical garden/zoo near the airport. I stopped at the front desk and got directions on how to take the bus there, but didn't really understand them. The girl wrote I should take bus "23,10,09" to get there and "52,59,94" to get back. The bus stop she directed me to didn't have a bus 23, or a bus 23,10,09, so I started walking in the direction I knew the park was (Mediterranean to my left), looking for another bus stop. Before you knew it, I had walked half-way to the park, so I decided to just walk and see how long it would take - just in case I decided to walk to the airport when it was time to leave. It took 1 hour 15 minutes for me to walk the 3.1 miles to the park. At least I was walking on the seaside, so it was pretty. I got to the park, went inside and walked around some more. I hadn't eaten yet, so I went to the snack bar and had french fries. A peahen came over to my table and made clicking throat noises at me while I ate. The woman running the snack bar told me the peahen would jump on the table and take my fries if I wasn't vigilant. I wouldn't have minded, but there are signs all over the park saying you shouldn't feed the animals. The zoo part of the park was a little strange. The flamingo exhibit had three of them. The lemur exhibit had two. The wallaby exhibit had about ten. I couldn't see the caiman in its tank, so I'm not really sure they had one. Overall, though, I'm not a big fan of caging animals, so I wasn't too disappointed that they didn't have more. I finished up at the park and asked the security guard as I left where I could catch a bus. I walked a long way around the park exterior and found a bus stop, but it didn't seem to have the bus I was looking for. Once again, I started walking the way I wanted to go (Mediterranean to my right), looking for another bus stop. Finally, after walking maybe 1/3 of the way back to my hotel, which was not where I wanted to go anyway, I asked a woman at a bus stop how I could get to my destination. She clarified that I could take bus 10 OR bus 9 and they would both take me near where I was trying to go. Bus 10 arrived just behind bus 23, and I got on it. It was super crowded and I thought that if I was going to get pick-pocketed in France, it would be on this bus. Finally we reached where I wanted to go, sort of, Avenue Jean Médecin, and I hopped off the bus. As I am prone to do, I turned and started walking the completely wrong direction. Luckily, there are lots of churches in the area and they are all marked on the map, so I knew when I got to a church that I needed to turn around since it was on the wrong side of the street. I made my way back to Vieux Nice and did some shopping for myself and for Christmas gifts. I crossed back to the pedestrian area, which was between Vieux Nice and my hotel, and stopped in a few more shops I had scoped out the two days earlier and finally made my purchases. Gifts for my cat sitters taken care of. When I got back to my hotel room, I learned that my tour for the next day wasn't going to happen because I was the only one who wanted to go to Italy that day. If there was another tour I found interesting, they would try to get me on it. Sure. I want to go to Monaco, so that's what we'll try for. I wasn't sure I would be able to stand after all the walking I did, but since all I had eaten was a tray of french fries and some desserts in Vieux Nice, I knew I had to go out and eat. I went to one of the places Vanya recommended the night before, but they weren't serving the full menu yet since it was so early (nearly 7 PM), so I had a pizza. Finally, I had a good pizza. Pizza and chamomile tea, which was 4€, by the way, and I headed back to my room for the night. The tour company had arranged something for tomorrow, but I wasn't really sure what. Adventure awaits! The hotel served a breakfast buffet for 10€. I could decide for myself if I wanted to partake after going down in the morning and looking at it. Their idea of a buffet and mine seemed to not overlap - rotting fruit and dry cereal. I asked the day concierge where I could get a "real" breakfast and she sent me down the street. The "real" breakfast (omelet, salad, pain au chocolat, half a loaf of French bread, a hot drink and orange juice) was called a New York breakfast at this place, which also made a big deal of selling "American" bagels. Rested and fed, I set out to find the old city, Vieux Nice, without looking at a map. I thought I knew the basic location (after having been there about 20 years prior), so I started walking down the Promenade des Anglais, with the Mediterranean to my right. I saw a new park area, so I went over and checked it out. I then followed signs toward Vieux Nice, but the signage in Nice could really stand some improving. I wandered around for a while. Eventually I found the old city and wanted to revisit a square with a church in it which I had been to when I was in college. There were lots of signs on the wall pointing to lots of different churches. I followed sign after sign and saw lots of churches, but not the one in the square I was thinking of. After walking around and around and asking a bathroom attendant for directions, I finally gave up and had lunch. I was so ready to sit down. The waiter who pulled me in to the restaurant gave me a free aperitif, sans alcohol, and, although I didn't drink it, limoncello after the meal. I drank this one, before the meal. Not the drink after the meal. The waiter sat a honeymooning couple beside me, because they were also from the US, and I gave the limoncello to them. The waiter was keeping the patrons segregated by nationality. I ate risotto, which was very good. I'm not sure I had ever had risotto before this. The waiter gave me directions to the church and square he thought I meant, and he was right. I had been circling around it all morning. It was the Reparata Cathedral, also called the Nice Cathedral, in Rossetti square. Just my luck that they were doing city maintenance in front of it when I was there. I also figured out that on the back of the map I had there was a larger map of the old city, but it still didn't help. I then went to the Colline du Chateau (castle hill) and walked up hundreds of steps to find the old cemetery. This was in the oldest part of old Nice. And I got lost--because that's what I do. And I just kept going up and down stairs. Finally I asked a city worker where the cemetery was, and I was, once again, basically around a corner from it. There were some spectacular views of the city from the top of the mountain I climbed, but most people probably visit it by car. Once I got up there I noticed there was a road right outside the cemetery. I worked my way down on the other side of the mountain, which came out in the port. Then I walked partially on the Promenade des Anglais and partially on the shore, back toward my hotel. The beach in Nice is privately rented and divided and you have to pay 20 Euros to go onto the beach, but since it was the off season, all of the beaches were open. Up on the promenade, all I could think about was getting to my room and resting a bit. I crossed the street to head back toward the hotel...which took me right past a casino. I had to stop in a try my luck. Before you know it I had lost 15€. That was my allotment for that, so I left the casino. And being poorer, I decided I should find a bank and get more money. I wandered into the pedestrian area of the city, away from the shore, and asked a waiter for a bank. He pointed me in the right direction and I was flush again. Back to the room for a little rest, then, sore from my day, I knew I only wanted to walk a very short distance to eat. I went for Italian and the restaurant owner, Mario, gave me a free aperitif, du sucre - non-alcoholic and sweet. And immediately I had my very own Italian stalker. Mario tried to get my address and phone number, but I didn't give in. He wrote his phone number on the back of my bill and insists he will come to America as soon as I call him. He had better not be checking plane fares. I went back to the room to shower and recharge for my next day. One of the beautiful pebble mosaics all over the city. I have to learn how to do this so I can make them in my yard. Breakfast at the B&B was fresh preserves with brioche. I also had a big cup of Lipton hot tea. I didn't understand at first that the bowls on the table were for drinking coffee and tea from, but caught on when I saw the Belgian woman drink coffee from hers. They were the size and shape of cereal bowls. Check-out did come with one surprise - cash only! You cannot imagine my relief that I had enough money with me to pay the bill. I don't know what I would have done if I was short - leave my stuff there and go in search of an ATM, I suppose. But that meant I had very little cash for the rest of my day. I left Saint Antonin Noble Val around 10 AM and had to be at the train station by 12:48 for my train to Nice. I couldn't get the GPS to understand Gare Matabiau, so I pushed the "home" button and hoped for the best. At least it got me to Toulouse - where I drove around and around and around. The "home" button on the GPS was actually programmed to take me to someone's home, not the car's "home." I got to the mystery house and then just started driving around the city. There were some signs pointing to the train station which I passed on my way to the mystery house, so I tried to backtrack and find a sign. But before I could return the car, I had to fill the tank. Finding a gas station was much more difficult than I anticipated. I passed the train station once while looking for a gas station, so I had some relief that it, at least, could be found. The only gas stations I had seen were when I first exiting the highway. I found the highway again, but no gas stations. I'm so used to LA where there is a gas station just about every few blocks. Time was ticking down. Despite giving myself about 1.5 hours of "getting lost" time, it was quickly running out on me. I was sure I was going to miss my train. There were some tears. But I figured, worst case would be that I rented the car another day and drove to Nice instead of taking the train. I finally found a gas station and filled the car, 1/2 tank for 40 Euros, and by then I had lost my bearings on the train station. I drove around and around and around with no sign of the train station. Worried I would need to fill the tank again if I just kept driving around, I finally hit the "home" button on the GPS again, knowing at least it got me near a sign for the train station. Turns out I had wandered nearly 20 kilometers away from the train station on my search for petrol. I saw a sign and followed it, finally driving toward the station with only 10 minutes left to catch my train. It was there. I could see it. I needed to just turn left and go about 100 yards and I could return the car. Unfortunately, I could only turn right. I had to go around the block again, which wasn't really just a block and was not a fast trip, and keep my fingers crossed that if I went up one block from where I tried to enter the parking before, I would be able to. Every red light, every car changing lanes without signaling, every pedestrian trying to sneak through against a light, they were all working against me. I kept going over the car return process in my head. "Just bill me! I can't stop and talk about this. Here are the keys!" I finally got to the garage entrance, at the same time as another car. I cut the other car off just past the entry gates - I didn't have time to be polite or worry about irritating a driver I would absolutely never encounter again in my life. I went as fast as I could up the ramp to the third floor and found the Enterprise parking. I didn't do the best job of parking and hurried out of my car. Naturally, the Enterprise spots were the farthest from the station and the elevator. With luggage in tow, I got to the elevators and one of the two elevators was out of service. Time was ticking down. I rode the one working elevator down, dreading that someone would call the elevator to another floor. Finally I made it to ground level and I couldn't find the entrance to the building. Another wrong turn, this time on foot. I finally got inside and found the Enterprise desk and they were closed for a bank holiday today - Armistice Day. I dropped my key through the slot for returning keys and hurried to the platforms. I needed platform 6, but where was it? With the bank holiday and my keys in the overnight slot, switching to a rental car was no longer an option. I had to find my train. Down an escalator. Platform 2, 3, 4, 5... 6! Up a flight of stairs - with a suitcase. There's the train. Get on board. I couldn't lift my suitcase onto the train, but a young woman trying to have last goodbye kisses with her boyfriend on the platform helped me so I would get out of her way. I stepped into the car, the closest one I could find, and almost immediately the car door closed. I had made it by seconds. I then asked other people near the door if I was, in fact, on the train to Nice. Good news, I was. On the way to Nice, the train stopped for about 40 minutes, on the tracks, in the countryside, requiring some maintenance. In Montpellier the train stopped at the station and I swear the conductor announced we would be there for another 50 minutes, but then the doors were closed and we...just sat there. But not for long. After all I went through to catch this train, it was running very late at all the subsequent stops. Just not at my stop. At least I had spent the extra 8 Euros for a first class ticket, so I was comfortable. And thank goodness for the Evian I bought in Andorra and the granola I packed for the plane. The train arrived at the station in Nice at around 9 PM. I headed to the information desk…where they were out of maps. The reluctant man who worked there gave me a map and apparently didn't have maps for the other ten people asking for them. I was just lucky, and perhaps looked the most desperate. I figured out the general direction I needed to head, and set out. On foot. I must have looked pretty rough, because a girl who was biking (at night) saw me and offered her assistance in finding my hotel. She walked her bike, leading me all the way to my hotel. Elodie. She was the highlight of my day and started me off having a friendly experience in Nice. My hotel, however, was not exactly up to par. The room was small and warm, which I like, but there was a terrible smell in the hallways and elevator. They didn't have room service, or night food service at the restaurant, so I went without food. They also didn't allow food in the rooms, so I was forced to only eat things which I could finish while walking, or eat at a restaurant. The TV wasn't adjusted properly and the English channels were all news - BBC, CNN, Bloomberg. At least they had some English channels. There was no bath, but there was a shower and the water was hot. I did break down and get a cab to the bus station for my 4 AM departure, even though it was very close, because I didn't want to be walking the steep streets in the dark with my suitcase in -5 degree weather at such an early hour. I still didn't know what that temperature meant, but I knew it was cold. I knew from taking the bus to Andorra that it wouldn't be very full, seatbelts were not worn by anyone other than me, and if I sat in a seat with other seats beside it I could stretch out and nap. The buses were small, with two seats, an aisle, then one seat. I was in the habit of taking the single seats each time I got on a bus, but I took a two seat group this time. It was still difficult to sleep on the bus. I arrived in Toulouse around 8:30 AM at Gare Matabiau and headed for the Enterprise car rental desk. I had reserved an automatic car, but there was a lot of confusion about if I had paid in advance or not. I know I was charged for the extra insurance I bought, but I couldn't remember if I was charged for the actual car. They put an 850€ deposit on my credit card and gave me the car. With no instructions on how to use it or a map or anything. Just - there it is. Bye! The square, plastic car key. The key in its holder. I drove around the streets of Toulouse a little bit and finally figured out that the car had GPS. I spent another 30 minutes pulled over to the side of the road trying to program my destination in the GPS. I finally was able to get the longitude and latitude coordinates of the B&B programmed in and I was off. The French highways are very nice and there was no one speeding. Everyone drove politely - right lane for driving, left lane for passing only. Even if a driver wanted to pass three cars, they pulled into the left and passed the first, then back to the right. Left again to pass the second, then back to the right, etc. I also encountered some unexpected toll roads before leaving the highway and going down narrow winding roads through vineyards. None of the signs had the name of where I was going on them, but I just followed the GPS. I followed it all the way to a dead end at a farmhouse - which was not my B&B. An old French man, looking very typically French, came out with a map and helped me figure out the GPS had lied to me and I was still 130 km from where I wanted to be - the E part of the coordinates appeared to be completely wrong. I was far enough N, but in the wrong E.
When I had tried to put the city name in, Saint Antonin, the GPS didn't recognize it - because there are 100s of villages in France with that name. Thanks to the old man with the map, I knew I was looking for Saint Antonin Noble Val (from the movie The Hundred Foot Journey) and the GPS understood that and took me to the right place. By then I was starving, so I stopped at a McDonalds for my first official meal in France. Just where everyone plans on eating when they are in France. The iced tea at McDonalds did have ice in it, unlike the other iced teas I had encountered so far on my trip, but the flavor had very little to do with tea. I drove another hour or so and found the road my B&B was on, and took it until it terminated at someone's farmhouse - not my B&B. As luck would have it, the owners of the B&B were just walking down the road near the church and gave me directions to their house, which I immediately misunderstood. I went down the road to a house with a wooden gate and disturbed some old French sisters who all live together and keep to themselves. Two of them came out to talk to me, but they refused to acknowledge they had a neighbor like I described, even though I had met that neighbor only seconds before and less than three houses away. I turned around and went back in the direction of the church, thinking worst case I would meet the B&B owners again. There was another wooden gate just behind the church with a small sign with the name of the B&B, so I finally found the right place. St. Antonin Noble Val as seen from my B&B. Despite arriving hours before the check-in time, the owners let me into my room. I cleaned up a little and went down to the town. Which was closed. Apparently both Sunday and Monday are non-working days in France. Oh, well. I was able to walk around the town, pretty much alone, and take some pictures. I went down to the river and sat for a bit, then returned to the B&B. After nearly 4 hours of being lost driving and 3 hours on a bus, I took a shower and had a nap. The deserted streets of the city. The view of the river. The owners of the B&B knew it would be hard to find something to eat in the area, so they offered to cook me dinner, for a fee. I told them I didn't eat meat, so they made a vegetarian dinner. It started with lovely salad, which I thought was the whole meal, but it wasn't. Then there was an omelet with the mushrooms from the region called cèpes (porcini mushrooms to most of us in the USA). Fried potatoes on the side. And there was a fresh apple pie for desert, with chantilly (whipped cream). It was a lot of food, but very good. After dinner we sat and had chamomile tea by the fire. The female owner of the B&B works in translation and does work for one of the companies in LA where a lot of my colleagues have worked - small world! She also likes to make jewelry. 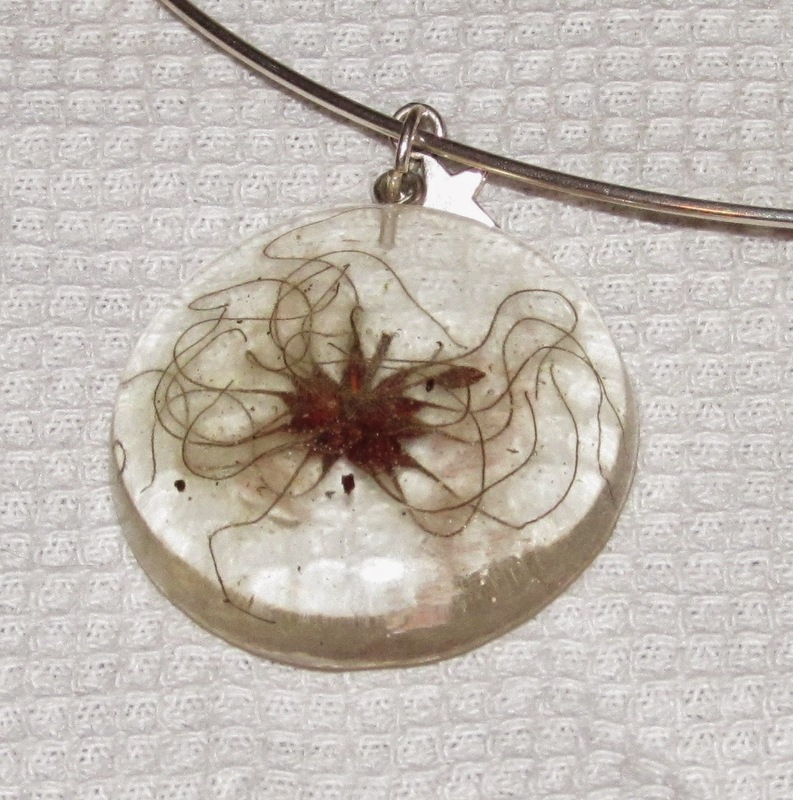 A pendant featuring seeds from the area. The only other guests in the B&B, since it is the down season, were a couple coming from their home in Portugal heading to their other home in England. The man was Welsh and his wife Belgian. They spoke French fluently, but were kind enough to speak English when I was around. They were traveling with two dogs. There were two cats living at the B&B - Diablito and Oscar. I didn't meet Oscar, but Diablito spent the night on my bed in my room, knowing I missed my kitties. The same company I booked to take me to my hotel from the airport, I also booked to take me back to the airport. They got me from my hotel at 8 AM and dropped me at the airport. I wasn't there for a flight, though, I was there to catch a bus. The information desk was able to point me to the platform. I still had at least an hour, so I went to a cafe and had a doughnut and...iced tea (a bottle of Lipton with sugar and lemon). Then downstairs to the bus stop. I was on my way to Andorra - not for any really good reason, but because if I was coming to Europe, why not squeeze in another country? For most of the bus ride I tried to either look at the scenery or sleep. We stopped in a town outside of Andorra Del Villa, which the bus driver didn't make clear, so I started to get off the bus along with a Frenchman who also didn't understand Spanish. The driver told us to get back on the bus, so we did. I spent a little bit of time talking with the Frenchman, Sam. He knew some English, I knew some French, so we each did our best to speak in the other's language, which seemed like a pretty good system. He was in Andorra for a job interview. Typical view from the bus to Andorra. My wonderful Spanish cell phone stopped working as soon as we hit Andorra. It kept sending me texts, though, to tell me I'm roaming and to ask if I want to send it more money somehow to cover the roaming. Too bad I understand none of the Spanish, or maybe I would have a working phone. We got to Andorra in the early afternoon and I walked to my hotel. I once again got bad directions, but found a police officer as soon as I suspected things weren't right and he pointed me the right way. I have noticed that "left" and "right" are mistranslated a lot when it comes to someone who doesn't speak English trying to tell you a direction in English. Always have them point. Andorra is the only stop on my trip where I stayed in a big chain hotel. The Holiday Inn. The room was very nice. Bigger than the other rooms I was expecting. But the walls were so thin I could hear everyone in the hallway and could hear when the people in the adjoining rooms were in the bathroom. I set out immediately to find something to eat. Andorra is a mountain town, so I walked up a very steep hill to the main area of commerce. I walked around and around looking for a place to eat and finally went to Mama Maria's pizzeria. I even picked up a little old man straggler who tried to talk to me, but he only knew Spanish, so we were in trouble. Even so, he wouldn't leave me alone until I ducked behind a sign. I had a TERRIBLE pizza and fried potatoes with garlic mayonnaise. And a coke. Downtown was decorated for Christmas. Researching online, Andorra was the only place where you were cautioned against drinking the water, so I went to a store and bought some water. The store was like a department store, like Macys, on the first two floors. On the third floor was a grocery store and on the fourth floor was Christmas land. Everything for sale for Christmas. I bought two bottles of Evian. I saw, but did not eat at, the highest elevation McDonald's in Europe. Then I headed back toward the hotel. Not a lot was open in the city and I was still pretty tired. When I got to the steep hill I saw there was an elevator for it. I took the elevator down and learned I was on floor 7, which in Europe means the 8th floor because the ground floor is 0. I had walked up that. The temperature was 9 Celsius, for whatever that was worth, considering I don't know Celsius conversions to Fahrenheit. I was glad my suitcase, with my coat in it, had arrived though. The view from on top of the hill, near the elevator. Back at the hotel I took a bath and couldn't get the stopper out of the tub. I had to use the comb they provided to pry up the stopper to let the water out of the tub. They had a 6€ charge for room service, so I went down to the bar and got some food to bring back to my room. A toasted cheese sandwich, on par with what I can make at home in a toaster oven, and some chips. I also had a pot of chamomile tea, even though I wasn't sure about having water, heated or not. The hotel had three English-language TV channels - CNN World News, BBC World News and cartoons. Both BBC and CNN were broadcasting the festivities from the Berlin Wall 25 anniversary, so I watched a little of that before going to bed. I left my iPad plugged in to charge, but apparently when you turn off the light by the bed, all of the power in the room is cut to save on electricity. Yay! I had a terrible night sleep because it was so noisy, and had to be up at 4 AM to catch my bus to Toulouse.